Last Tuesday several of us from the Syria Solidarity Movement attended the London launch of the Syria Freedom Charter, hosted by Amnesty International. Rafif Jouejati of FREE Syria, the principal architect of this project, introduced the Charter and explained how it came about. Inspired by the South African Freedom Charter, the guiding document of the South African struggle against apartheid, Rafif and her colleagues drafted a set of propositions that expressed core democratic values—such as freedom of speech and religion; equality of all citizens regardless of gender, ethnicity or religion; the accountability of government and armed forces; and the right to education and health care. A team of 100 activists then went out to canvas responses both inside and outside the country. Those propositions that received majority endorsement were then compiled into the “Freedom Charter”. Altogether more than 50,000 people took part, drawn from all the regions of Syria, including both regime and opposition controlled areas, and from refugees and expatriates. As can be imagined, this was a very difficult exercise which had to be conducted under the nose of hostile regime—and sometimes opposition—forces. That means, as Rafif pointed out, that it cannot be treated as a statistically representative opinion poll. But it is a very important declaration of democratic aims and values by a large body of Syrian citizens. Given the uncertainties surrounding both Syria’s present and Syria’s future, that is a very valuable instrument to be in possession of. As one Syria Solidarity member suggested in the discussion, it is a document that can be used to open up dialogue with an even wider cross-section of Syrian society, including in particular those involved in the armed opposition groups who are equally Syrian citizens. It can also be used as a basis for discussion with those like the Syrian Kurdish parties, who also affirm a commitment to democratic values. 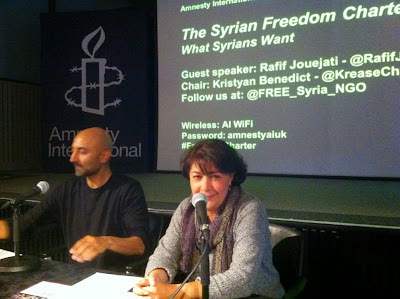 Rafif is inviting Syrians inside and outside the country to sign up to the Charter, with the ambitious target of gaining one million signatures. This is a project which deserves the support of all those who care about the cause of democracy, freedom, and dignity. The South African Freedom Charter was debated and agreed by a “Congress of the People” in which 3,000 delegates representing all the country’s democratic organisations gathered together. It speaks volumes that something that could be done in racist South Africa 60 years ago is inconceivable under the regime of Bashar al-Asad in Syria today. We can hope that in the not too distant future Syria will be able to hold its own Congress of the People, either in the wake of the downfall of the regime, or in a secure liberated zone. But until that day comes working to build support for this Freedom Charter is the best way to lay the ground for it. For the full text and further information on the Charter see the FREE Syria website. Below is an informative extended interview with Rafif By Danny Postel. really inspiring document, to anyone supporting the Syrian revolution. It would be really great to hear from Syrians - including minorities like Palestinians and Kurds, and women too - about whether it is inclusive enough to embrace all their dreams for a common future, which may be closer than we thought!